This is a famous outdoor organizer park in Wexham. 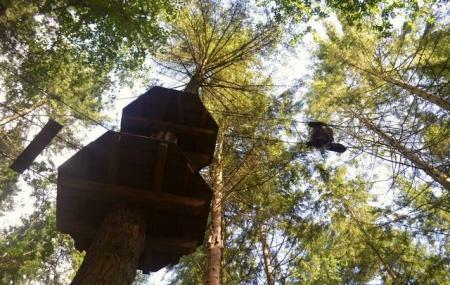 The 530 acres of woodlands here is known for the famous rope climbing canopy sports. There are about 31 different types of adventure to make you wow in the field. There are various packages for the adventure games here. The most interesting part of this park is that you will get a certificate after completion of the tasks. You will be amazed at the tree lines and zip line adventure here. You can take your dogs out there for a walk as well. The kids are sure to love the tree top juniors. Find the joy in planning a D.I.Y. trip by using this awesome Burnham trip planner. You can add cozy hotels in Burnham like Sunningdale Park, Thistle London Heathrow Terminal 5 and Holiday Inn Express Slough. Find out how to reach Burnham to begin with. Plenty of wholesome Burnham vacation packages are available to choose from, pick your today! Great day out. Takes about 2-2.5 hours to complete the course of 5 zones. A bit pricey at £30 per person. Friendly, helpful staff. Gym gloves would be handy. Brought kids to the Tree Top Junior section and they thoroughly enjoyed it. Basically just harness up and walk across platforms setup across the trees which leads to the zip line. Once they have gone down the zip line it's just "rinse and repeat." The £18 pp for only a hour is slightly steep in my opinion especially if your party consists of 2 or more people.